"Crap. I do not want to do this." The second thought that came to mind was: perhaps I shouldn't be so quick to dismiss my 'Civic Responsibility.' I am eternally grateful that I am a citizen of the United States, and trial by peers is one of our cherished legal rights which is not available in other countries around the globe. But over the ensuing days I thought about this a little more, and I began to form the opinion that I have already fulfilled 2,973 days of civic responsibility during my time in the military. Now, for those of you who have never served in our nation's armed forces, you may think that is an unfair attitude. But let me be very clear: during my eight years of military service, the Army owned my life 24 hours a day, and it often made good on its possession. I spent hundreds (if not thousands) of hours working in abhorrent conditions in obscure areas around the planet which the average person doesn't know about, and I did so at any hour on any day - regardless of the weather, physical discomfort, or extended separations from loved ones. During my tenure in uniform I endured countless nights trying to sleep in a makeshift lean-to in subzero temperatures, scorching desert heat, and torrential downpours. I also missed dozens of holidays, birthdays, anniversaries, etc. So believe me when I tell you - we veterans have already done more than our fair share for society. 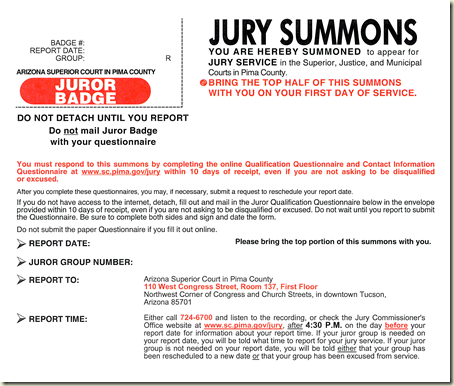 With that in mind, I started to think that all honorably-discharged veterans should be exempt from jury duty. But then again... as I continued to ponder the subject, I began to think about what the impact to society would be if we exempted all veterans from jury duty. As I watch the news, I am amazed at the lack of responsibility that is so prevalent in North America. When someone does something bad, they generally refuse to accept responsibility for their actions. But when society attempts to punish a person who has done something wrong, large-scale riots break out in protest. When these riots inevitably destroy cities, their apologists claim that none of the rioters were at fault - it is their 'oppressors' who are the evildoers. But the worst part is - if someone is ever taken to trial for their part in these tragedies, the courts often let the guilty parties go without punishment. A group of defense attorneys were able to successfully use the following defense: "They were simply part of a mob; individual actions do not matter." In the end I came to the following resolution: even though I may not want to give up a day of my life to serve on a jury, perhaps I need to. Our society desperately needs more people who are not afraid to use the word "Guilty" when it needs to be used. So even though I will undoubtedly be bored for most of the day, I will be bored with a better attitude. Look, I get it - companies are in the business of making money. I like a good paycheck, you like a good paycheck, everybody likes to receive a good paycheck. But that being said, everyone who has ever bought something from someone else has realized that the people who are doing the selling are charging you more money for their merchandise than what they originally paid for it - that's called profit, and that's how they make their living. We implicitly accept this arrangement every time that we make a purchase, and I have no problem with that. In principle, at least. But every once in a while I run into a situation where someone is so blatantly overcharging that I no longer want to deal with them. I recently dealt with a company which attempted to keep my business by using "Hard Sell" tactics when I contacted them to cancel my account. When they asked why I was cancelling, I said it was because I could get the same service through another company for less. They replied that "since I was such a loyal customer," they would be willing to match the other company's price. At this point I said, "You realize that you just admitted to ripping me off for all of the time that I have been your 'loyal customer?' If you were willing to provide the same service at a lower cost all along, why didn't you do so earlier? That would have kept me as a customer! But now I think you're just a bunch of thieves; so unless you're willing to refund what you have been overcharging me, just cancel my @#$% service and let me get on with my life." That ended the sales pitch and they cancelled my account.